Union City Council members discussed allowing EMS and fire workers employed by the city to carry concealed firearms while on duty at their monthly meeting Tuesday night. 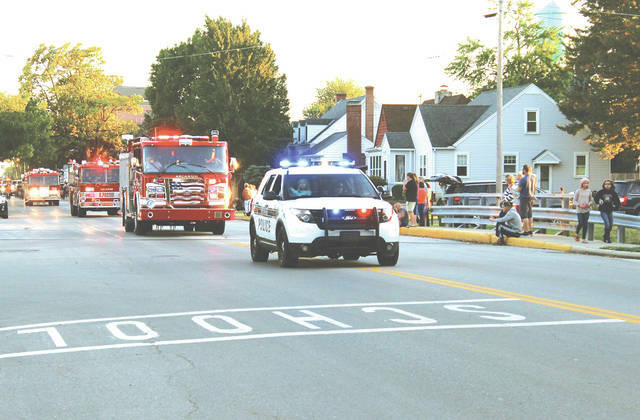 UNION CITY — Union City Council members discussed allowing EMS and fire workers employed by the city to carry concealed firearms while on duty and also passed an ordinance governing the use of golf carts on the village streets at their monthly meeting Tuesday night. “I feel like they should be able to protect themselves,” Union City Police Chief Mark Ater said of the city’s firefighters and other first responders. Ater presented a model of the proposed policy, based on similar regulations in a few other cities in Ohio, to members of the council, who suggested getting in touch with the city’s legal counsel “to make sure everything’s legally on the up and up,” according to Ater. Ater said while policy among emergency personnel will still be to wait for law enforcement to arrive before heading into a dangerous situation, there always is the chance that fire or EMS workers could encounter unexpected dangers while in the field. Ater said the planned policy would not only require emergency workers in the city to get a concealed carry permit but also to undergo yearly firearms training beyond what concealed carry laws require. The golf cart issue, meanwhile, has been under discussion since at least June when Union City resident Richard Byers addressed the council, saying he thought a law allowing residents of neighboring Union City, Indiana, to cross the state line and use their motorized golf carts on Union City, Ohio’s streets would be advantageous to the city’s economy. “They could go to Sutton’s, Casey’s, the drive-through, the A&W stand,” Byers said. Ohio law allows for golf carts to drive on roadways with a posted speed limit of 35 miles per hour or less. There are certain requirements the carts must meet, including the presence of a rear-view mirror, seat belts, turn signals, brake lights, headlights and tail lights. Operators also are required to have a valid driver’s license and liability insurance. Because Indiana laws are less stringent, golf carts coming over from the Indiana side will need to be inspected and receive a permit from the Union City, Ohio police, at a cost of $20 per year. Chief Ater said the carts will be allowed to traverse city streets except for Main and Elm Street, which they can cross but not travel down. This entry was tagged Concealed carry, EMS, Fire department, Golf carts, police, Union City, Union City Council. Bookmark the permalink.